The Mizer Composter and Rain Water Collector includes a compost tumbler much like the Rotator Compost Tumbler. The Mizer Composter and Rain Water Collector takes the backbreaking effort out of turning your compost. You won't need to struggle with forks or shovels, trying to tear apart a packed, root bound, brick of material. The large capacity compost drum rotates on a stable base providing quick and easy mixing. Just turn it about once a week to keep oxygen, nutrients, microorganisms and moisture evenly distributed throughout the developing batch. The Rotator Compost Tumbler arrives fully assembled so you won't spend frustrating hours putting it together, and it's low-to-the-ground profile means you won't need to lift materials high in the air to fill it. 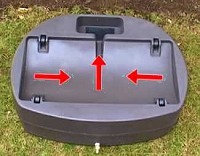 With this simple design, you can begin turning your garden and kitchen waste into valuable organic soil in just weeks. The Mizer Composter and Rain Water Collector includes a rain water barrel collection system integrated into the base of the compost tumbler. The innovative design cuts down on the cost of buying separate units and it also saves space by reducing your footprint. But even more significant is the way the whole unit works together to fuse earth and water. As the top barrel is rotated, gravity and centrifugal forces squeeze out excess liquid from the compost which flows out onto the base where it's channeled into the barrel. From there it mixes directly with the rain water collected from your gutters forming nutrient packed plant food. Water is a precious resource we cannot let go to waste. Rain barrels reduce the amount of water draining into sewer treatment facilities, while lowering the impact of roof top runoff. Collecting and storing rainwater provides a backup source of outdoor water use during times of drought or between rain showers. It helps to keep creeks, lakes and beaches clean by reducing the amount of chemicals washed into bodies of water from urban runoff. Rainwater is also naturally chlorine-free. Using chlorine-free rainwater for your lawn and garden helps maintain a thriving biotic community in your soil. 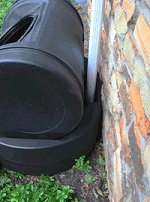 We’ve created the Mizer Composter and Rain Water Collector to help make your composting efforts easier. With stationary composters, material is added in layers, and “turning” the compost pile is difficult and often a smelly, messy project. As ingredients are added, layers pack down and germinating seeds produce fibrous roots throughout the stack. These roots lock together forming a brick of matter that’s hard to break apart - even when the batch is finished. These stagnant layers can keep hot (biologically active) and cold (biologically inactive) areas from digesting for long periods of time. 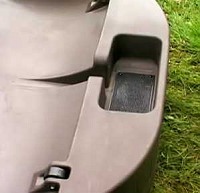 By placing the rotating bin of the Mizer Composter and Rain Water Collector on it’s base, you’ll be able to turn your batch without the backbreaking task of moving material with forks or shovels. Frequent turning greatly speeds up the composting of materials and also prevents “germinating roots” from “webbing” the batch into a solid brick. Please allow 1 to 3 weeks for delivery.